Today I began working on one of the tracks entitled Deep (f/C3), from the EP . The entire release will have a fair share of beats and samples, but at the same time, actual instrumentation as well (myself and a few guests as mentioned in the previous post). This track I’m particularly fond of already because it will be a collaboration with two very talented artists – Trel Robinson and Todd Kelley – together we have recorded previously material together under the name Cross Country Collective, or C3. C3 was born to compose, record and produce tracks remotely, but release them as a product collectively. I became a part of C3 for the 2010 release Contempojazzsoulhop. Contempojazzsoulhop got it’s name from infusing the stregnths of our individual styles – Trel (soul), Todd (hip hop soul) and me (contemporary jazz). For those of you that haven’t heard it, give it a listen, you’ll find other C3 tracks at the Bandcamp site as well. I had the pleasure of coming back to record as C3 on two tunes from Todd Kelley’s latest 24-track release Moods. Knowing Todd’s unique style of birthing silky soul (and hip hop) comprised of smooth beats and sample arrangements, and Trel’s soulful ballad and R&B laced keyboard playing talent, Deep (f/C3) is a track I’m excited about hearing when it’s finally ready. The foundation of it is minimal (on purpose), so the palette is wide open so far. Once I have an idea for a track (be it starting with writing the arrangement on guitar, or being inspired by different samples I come across, or both), I always start laying tracks in Logic. For this EP, as a whole, I’m looking forward to not just using Logic but incorporating NI Massive and Maschine, using a few “vintage” hardware synths in my studio rack, bass guitar, electric and my 35 GB, ever expanding sample library. Also got a track out to guest saxophonist, Kelvin Wilson. The song I wrote a few years back so the scratch track is fully arranged. He did great work on the current single from AfterSix Productions, Chamorrita. I’m a heavy thinker (probably why I sleep like a baby…lol), that fact in itself inspired the title for this track. Thus far the flow and feel of it seems to reflect that. I think it’s gonna turn out to be nice. I’m gone. Enjoy the day/evening/night. While the AfterSix Productions project is final wrapping up for release (and a second project in the works already), I’ve wanted to do a solo project for years, as well. Like many composers, we all have *vaults* with songs in various stages of development. It turns out that over the last two years, I’ve amassed enough such tracks for five solo projects, Halcyon Sky being the first. Some of you also know I’ve been doing a podcast called The Sunday Soundtrack since 2008. This podcast features independent artist tracks in the downtempo/chillout/smooth electronica/nu-jazz genres, in short, an alternative to mellow smooth jazz. 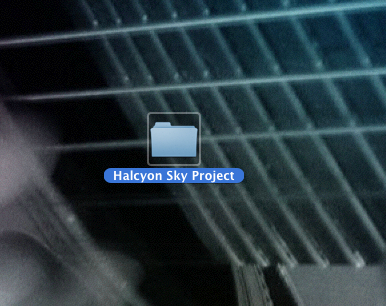 Halcyon Sky will be a 10-track release of original songs I’ve composed reflecting those genres. To date, one track is finished, the other nine are in various stages. I’m excited to present one track as a collaboration with two other talented artists, and two other guest appearances on two other tracks…details to come. That’s it for know…updates to follow.